So just the other day I was sitting at my desk in my office looking toward the dining room…..and noticed how boring the wall was that has the cut out opening. I didn’t want to add pictures or art on either side as I have a gallery wall already….and knew it was enough. I’d considered barn doors…but it just didn’t go with the vibe I have going on in here….and I don’t really need doors! AND it just hit me!!! THOSE FRENCH DOORS!!!! I could flank them on both sides!!! Well how convenient that my son Brody (aka Mr. Fix it) was in town! I mentioned it to him…and within minutes we were in full swing of the SUPER easy SUPER fast revamp!!! You can see below the doors in their “before” state. I knew we would need to cut off the curved top of one door….and make them appear as one tall french “shutter”. So that is what we did! And here is the outcome!!! It really was almost that fast!!! We measured….trimmed….glued….screwed….clamped…..painted…..and hung! That was pretty much it! Also….would you take note how huge this guy is??? He makes that opening look small…and it’s NOT! This poor kid hits his head on chandeliers and hanging holiday decor all the time!!!! He takes up the entire doorway!!! He’s 6’4″ and 250 lbs of HEART…let me tell you!!! I really love the way it looks! It added the perfect touch to a very boring wall! Just a touch of black and gold…and a touch of FANCY. Now I sit at my desk and get this view from the corner of my eye…and I love it! 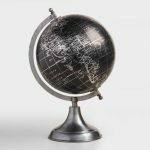 It feels sort of worldly to me…LOL! Like a french cottage retreat….it’s so crazy how something so small can change the vibe! 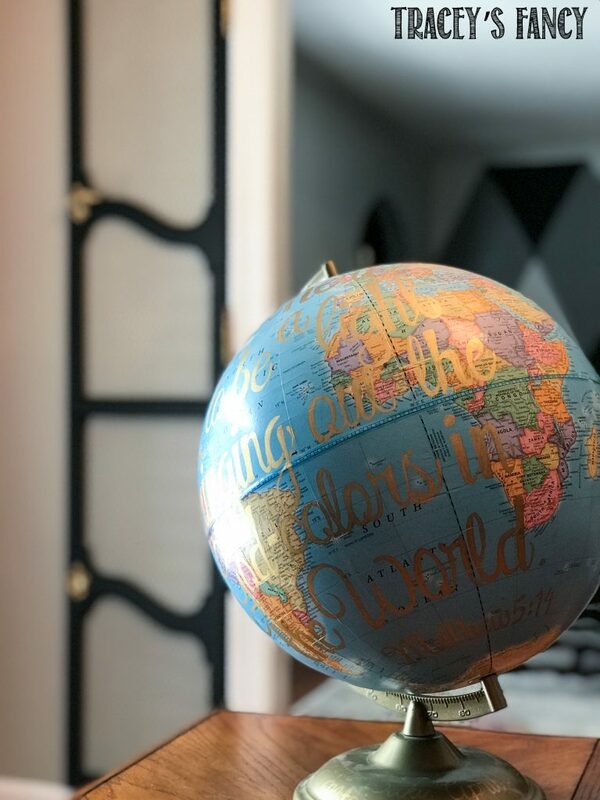 And speaking of wordly…how adorable is this globe that a group of my girlfriends painted for me. It’s the bible verse “You are here to be a light, bringing out the God-colors in the world” ~Matthew 5:14. It means so much to me…and what a great DIY gift for someone! 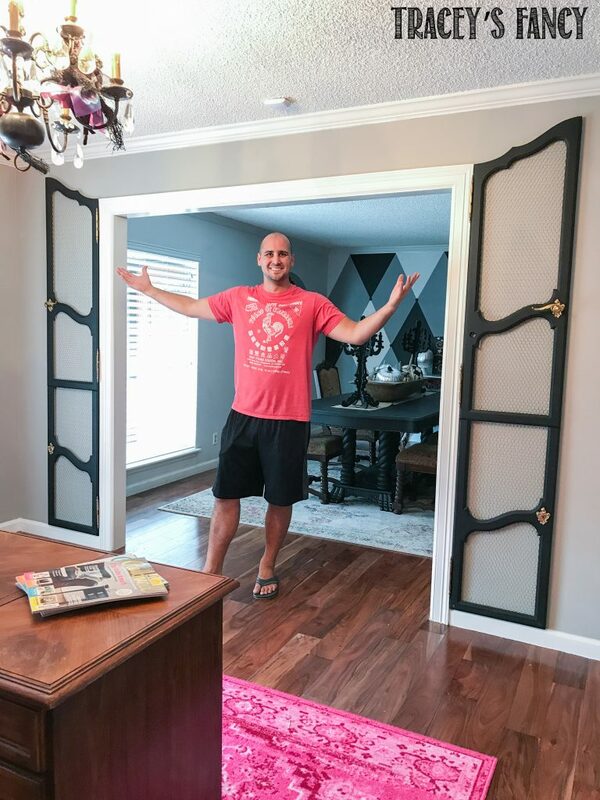 I am thrilled that I listened to my heart and saved these doors! 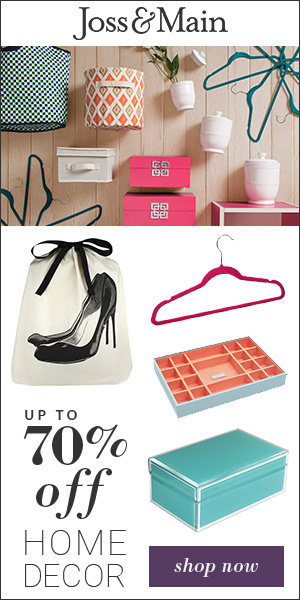 I have always loved using items in an unexpected way…. This space is slowly coming together. I know….I need drapes on that window…there are actually TWO windows. I plan to have plantation shutters installed…so I am waiting for those before I decide on drapes. I am open to suggestions!! 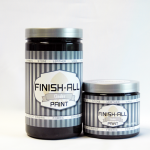 I used a paint by Finish All called Cinder. 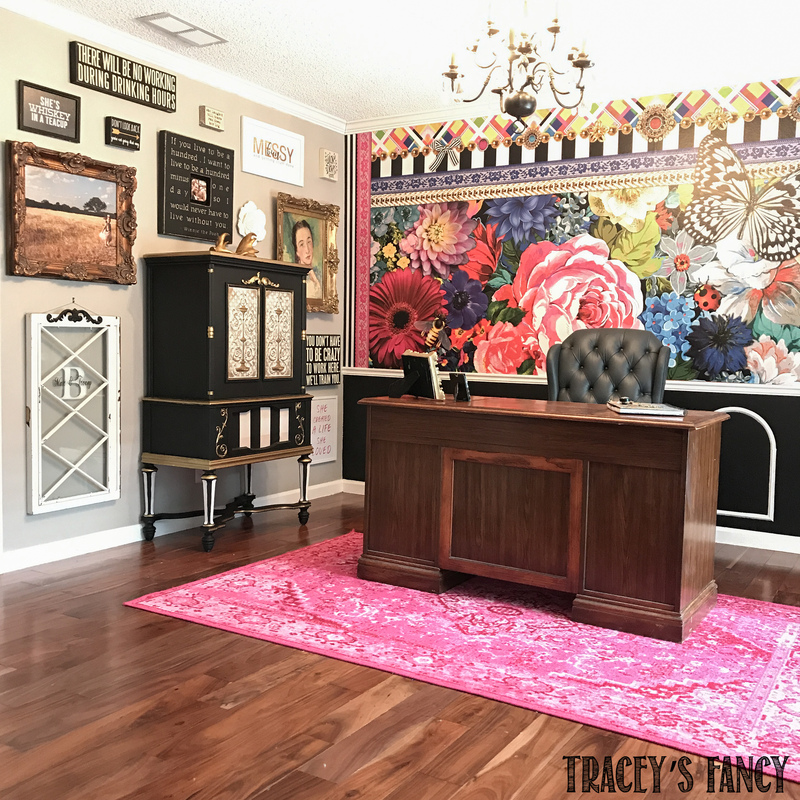 It is an all-in-one paint that requires zero prep or sealer…and it’s is the same paint I used on my dining room table. 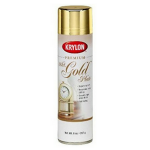 It’s extremely durable and offers a great low luster finish! I sprayed the hardware with my favorite “go-to” gold foil spray. And lastly….take note of the stack of Reloved magazines on my desk!!! I have a project featured at least once in each edition. It was such an honor to be asked…..and I keep them there to see daily to remind myself that hard work DOES pay off….even when you are “just a painter”…LOL! where can i buy amoxicillin over the counter So the moral of the story is….if something speaks to you with its shape or style or simplicity or fanciness…..don’t toss it! Hang onto it….and know that it has the possibility to bring you great joy in another form someday! Here’s a few of the paint products I used for your shopping ease! 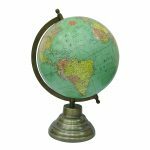 I also found you two globes in case you want to paint! You can see my entire list of fave products here on my Amazon influencer list. Thanks! Can we also take a moment to love on the gallery wall in my office??? This wall sits to the right of my desk….and is actually visible through a large window as people approach our front door. With the exception of the floral mural…..it is my favorite wall in the house! The photo graph of the little girl is my daughter Zadie and the oil painting to the right is her great-grandmother Zaidee….whom she was named after! Isn’t that special? 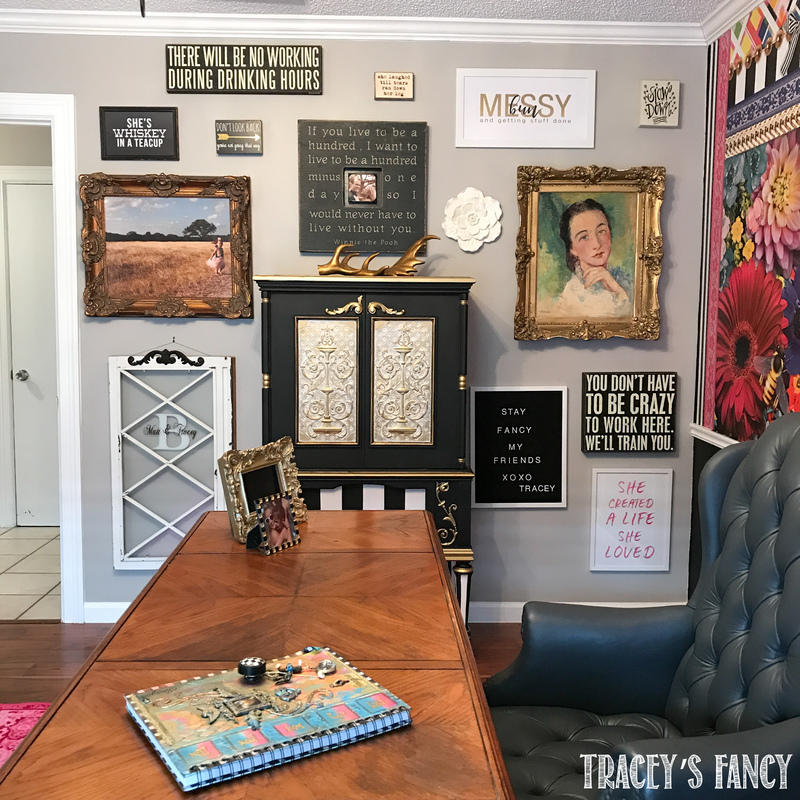 I did not purchase anything for this wall….they were all collected over the years…or given to me as a gift….and every single item has sentimental value! I took the gallery all the way to the baseboards…..which you don’t see often…..and I really like it! I chose to keep the wall more neutral with black/white and gold…..so it wouldn’t compete with the busy floral mural……and I think they are very pleasing to the eye as a pair! Every single person that visits our home….comes to stand before this wall…..as if it calls them by name…LOL! I’ll call that a success! I’m a firm believer in “do what feels right to you”! There are no rules with a gallery wall! Just be free with it……and enjoy the process of creating it! 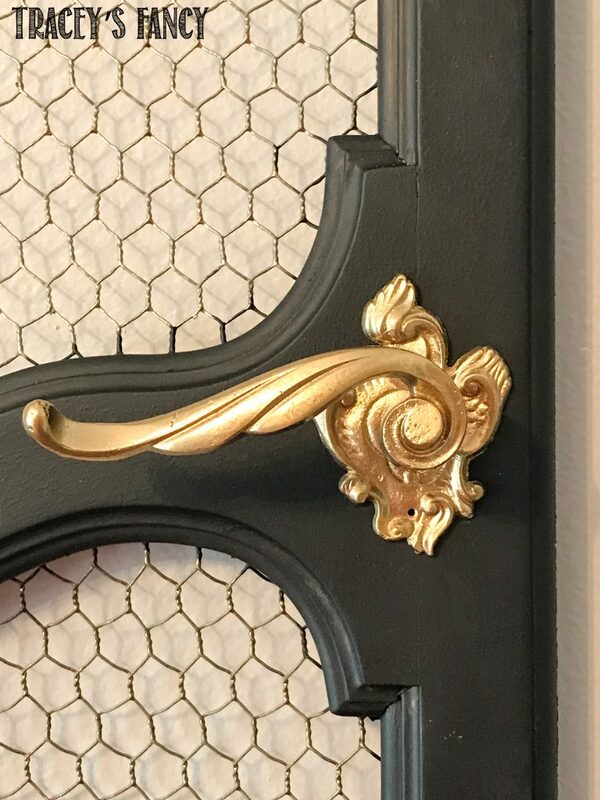 Please please please share my Decorative Shutter pin on Pinterest and get more ideas on my Doors & Shutters Board & follow me here. Just amazing! I love, love the fact that my husband builds houses. He recently started doing project management for some pretty upscale remodels or basement finishes. Unlike you, he is packrat! Seriously, it’s that bad and use to annoy me, but I come to appreciate his propensity to bring anything (practically) that people, much like your client, don’t want or just don’t have a use for. We have so much packed away that I never run out of projects! 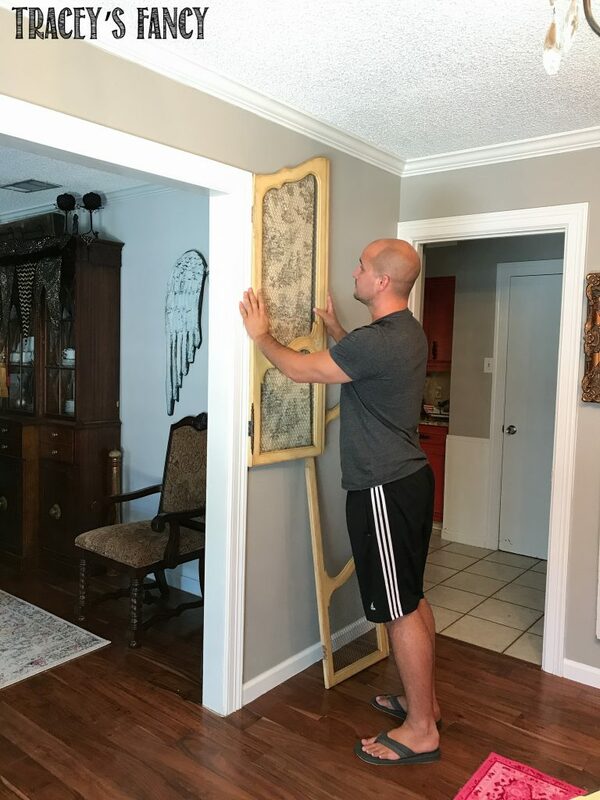 I love the way you painted your dining room – I have big plans for ours with the circle wainscot, and already have the BM paint here waiting to do a faux marble on one wall. I fell in love with both ideas when I saw them. The other thing that stood out right away was your hardwood floor. We have, actually months ago, while on sale purchased hand scraped hardwood acacia and it looks identical to your hardwood floor! 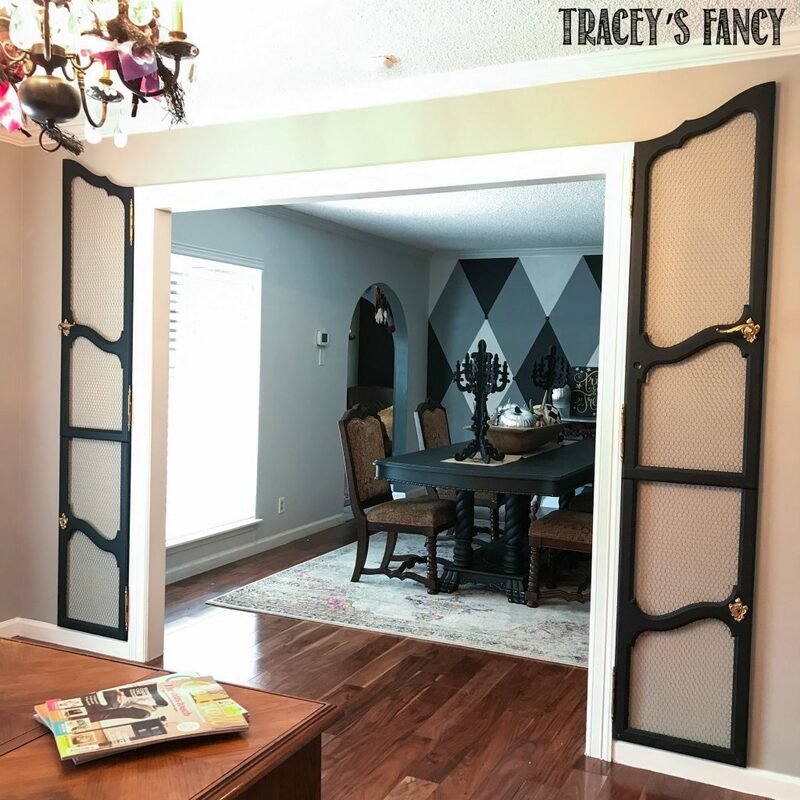 I’ve only so far had a chance to see your first project – but, truly those doors look amazing. Funny, just yesterday I purchased some sunburst applique to put on my armoire and am still deciding on the use of the colors I am using. 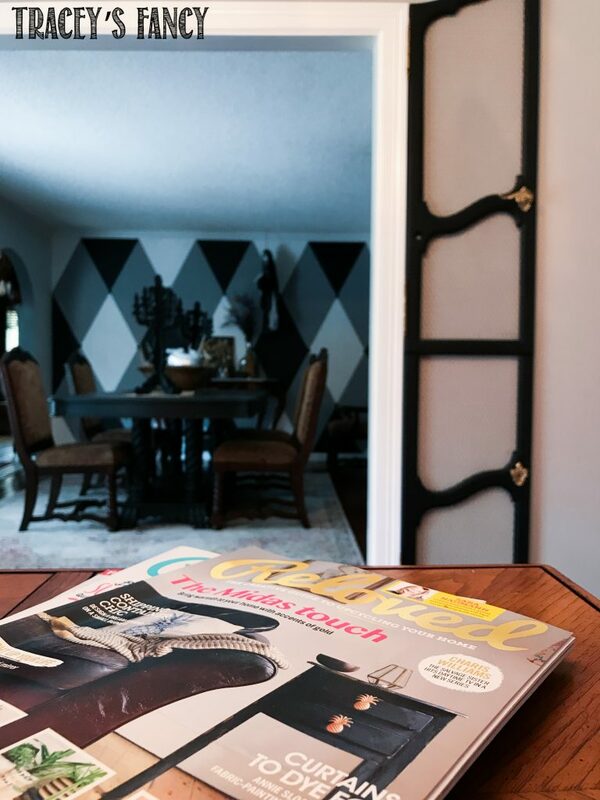 I have Behr paint that I used on many pieces in our room – so I just love to blend and marbleize though. 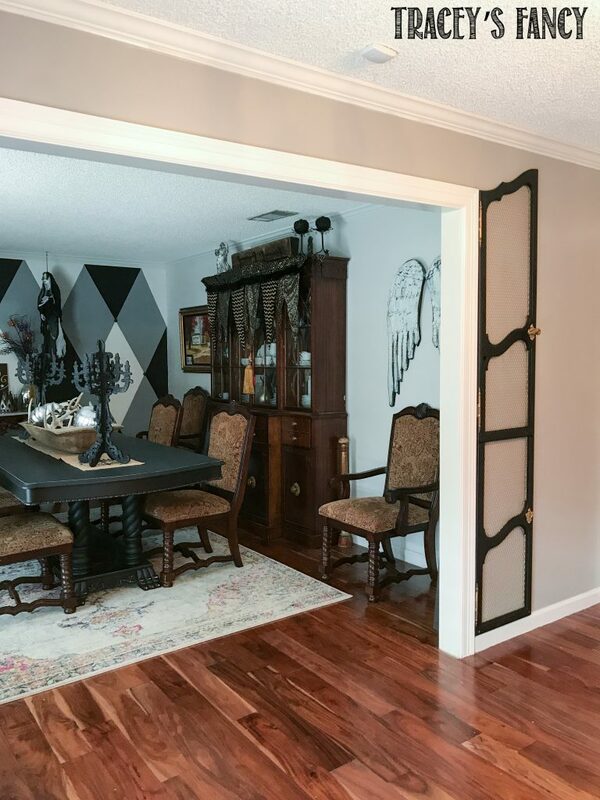 I also doing a faux leather wall in the Family room – but he has to first put in an arched open entrance! I don’t even know which projects I am doing day to day — my list is unbelievably long. I love your enthusiasm and clearly, the work you do! Wow!!!! They look great (and so does your son). Your home is beautiful! What is the pink on the chandelier that’s in a couple of the pictures??? Your “reloved doors” are perfect! So is your son! Are we “Moms of Sons” not the luckiest people in the world! I’m so glad I found your blog. Two questions, do you have a tutorial for painting your diamond checked wall? I have an old iron bed frame that I want to paint. Can I use the Cinder paint? Hi Kenetta….I don’t have an actualy tutorial for it. I do believe I did a FB live in the past….but not a true instructional. However….I do have plans to do another FB live AND tutorial on this for walls and furniture. If you are signed up for my newletter….you should receive notice of it once it has been released. And yes…Cinder is perfect for the iron bed frame! THanks for being here! Thanks Marisa! I love them too!